From Left: Dr. Elisha Attai, Founder, African Women in Leadership Organisation; Ezinne Kufre Ekanem, Chief Executive Officer, Rosemary’s, The Soft Furnishing Company; Kufre Ekanem, Managing Director, Philosoville Limited, initiator of Hymnodia and John Senaya, Chief Executive Officer, J S and Associates, during the flag-off of Hymnodia, a reality TV programme, at Ikeja City Mall, Lagos. 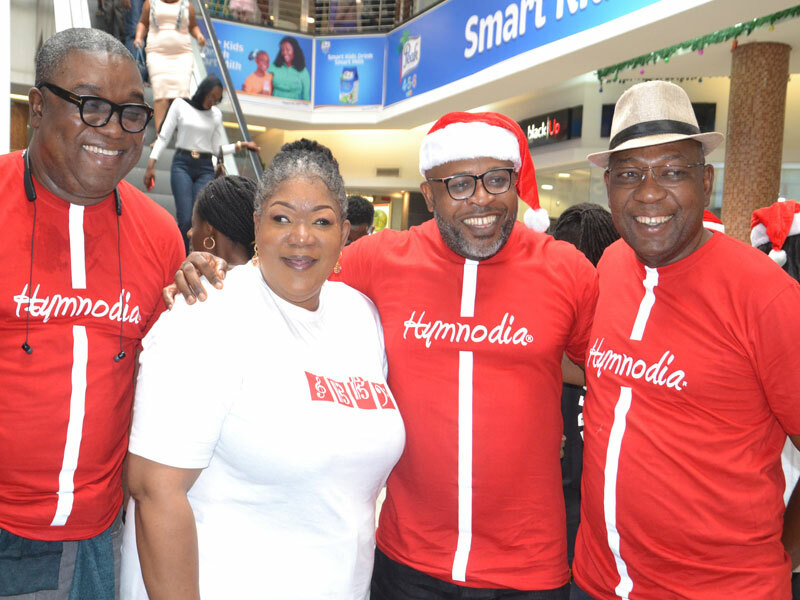 To elevate the hymn culture, Hymnodia, a new reality television programme was recently launched at a city mall in Lagos in a frenzy atmosphere of singers with shoppers-turned-audience. Hymns are essential ingredients of popular inspirational music and there has not been a music reality show to promote it as much as popular music. The launch was like a pilot edition, with many shoppers found singing along to the music. Initiated by Philosoville Limited, it featured crowd-moving performances of the 30-member choir, signaling its call for entry to the show. The Managing Director, Philosoville Limited, Kufre Ekanem noted that Hymnodia seeks to revive the hymn culture and worship as a critical element of what cohesive societies require. He added that Hymnodia revolves around members of a world class choir who contest to showcase their skills as singers, writers and hymnodists to deliver soul-lifting songs. “It is designed to redefine the perception on hymns and reposition the minds of Nigerians on the almost forgotten art and value of hymn creation, writing and singing,’’ said Ekanem. At the moment till January 21, many who find the sound of the show fascinating are visiting the Hymnodia website to apply. Part of the requirements are a maximum 60 seconds self-video of hymn rendition shared on leading social media sites using the hashtag #hymnodiahq. The 13-week show will culminate in choir performances. The winner of Hymnodia will be announced at the grand finale of the contest on April 21, 2019 with the reward of ASAPH, a specially designed trophy, a brand-new car and a cash prize of N5million. Hymnodia is set to be an annual event of reinvigorating rhythms to reward creativity and outstanding talents.